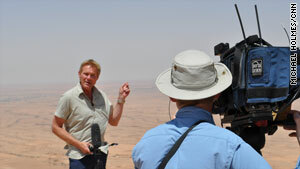 Michael Holmes, a CNN International correspondent and anchor, reports on the conflict in western Libya. Editor's note: This piece is part of a CNN.com series about storytelling and reporting skills called iReport Boot Camp. In this edition, CNN.com Senior Supervising Producer Manuel Perez shares his advice on picking a great story. Read up, then give Perez's advice a try in this week's iReport Boot Camp challenge. (CNN) -- Stories are a basic part of being human. No matter our background, our age, what we do for a living or where we live, everyone enjoys a good story. Whether it's a story told among friends or family, or a story we're reading, or seeing in photographs or video, a story can make us laugh or cry, anger us or comfort us. Sometimes, it can fascinate us by telling us something that we didn't know before. And often, we'll want to share it by telling others about it. It's that ability to stir a response that can make a story memorable, whether it's a story you're telling your friends, or a story you're posting to iReport. We'd love to hear your story. With that in mind, here are some simple thoughts you can use to help make your story for iReport boot camp one that others will want to share. The best stories are always about things that matter to you, whether you're the one hearing the story or the one telling it. So choose topics you feel a connection to when you're picking the type of story you want to tell. It can be about anything -- from your take on a big national or world story, to something closer to home such as your neighborhood, your family, a trip you took this summer, how to make a great bowl of chili or even your childhood memories. What matters is not just the subject, but how much the subject matters to you. If you care about it, chances are you'll be able to get others interested in the story. Find out as much as you can about your subject. Not just facts and figures, but take some time to find different points of view and opinions. You can do this through research or by talking to people who are experts or have had personal experiences with what you're writing about. Chances are you'll learn something new, be able to ask better questions during your reporting and be able to bring more authority to your storytelling. Often, you'll find that what you learn leads you to different approach for the story than what you were initially thinking. In many cases, your story will be more interesting if you can bring it to life. Video, photos and graphics are great ways to do that. You can also convey a sense of place, or someone's personality, or a mood through writing that captures the right details and observations. Avoid generalizations and vagueness. Another way to put your audience in the story is to tell the story through the eyes of people who have a direct connection with the story you're telling, and letting them tell the story. Stories about the economy, for example, are often much more interesting if we can see how people are being affected. A story about what the war in Afghanistan is like is always stronger when we hear it from someone who is there on the ground. If we really want to know how bad it was in New Orleans after Hurricane Katrina, what better way to do so than to hear directly from the people who lived through it? When talking with your friends, you probably would tailor your voice in different ways depending on the type of story you're telling. You would tell them a sad story, for example, in a different way than you would tell them a funny story. In the same way, you should think about what "voice" or tone you want to use for your iReport depending on what it's about. Bring your personality to it. This is an opportunity to be creative, and it's also a key way to bring out that emotional response in our audience and make your story memorable. Keeping an audience interested in a story is always a challenge, especially when you are picking a topic that has to be relevant seven weeks from now. So remember to keep your audience in mind when you pick a story to cover. Think about things that still will have interest at that time. Think about what angle you can take on a story about which people will be able to relate. Are you ready to share your story? We'd love to hear it. Please pitch us your idea in a two-minute video by Monday, August 15. And remember at the end of boot camp, the best stories have a chance of being published on CNN.com.